It could not be more simple to make croutons right at home. 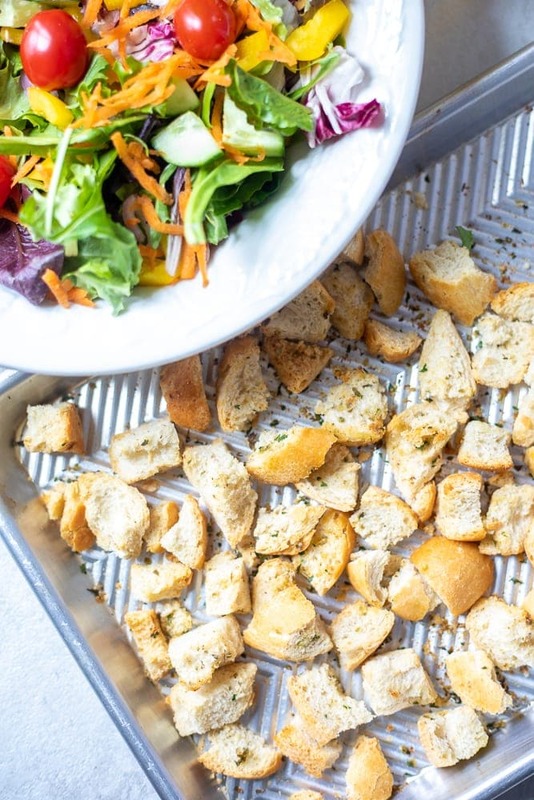 These Homemade Croutons come together in minutes and are perfectly seasoned for a delicious crunchy addition to salads or soups. I love using these homemade croutons on salads, to top Tomato Soup, or even as a base for Homemade Stuffing. At every dinner with my extended family, my mom insists that the salad is served with croutons. To SOME people in my family croutons are like bacon–they convince them to eat ANYTHING. And while I do not need to be convinced to eat a salad any day of the week, I can not lie–I do love croutons on a salad! Croutons provide just the right amount of crunch and texture a salad needs. Not to mention, flavor that sometimes can be lacking in a simple tossed salad. And they are SO easy to make at home. But they are also cheap to buy. So why should you make homemade croutons? 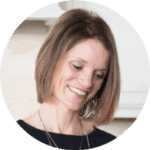 You can control quality of ingredients–no corn syrup, preservatives, etc. 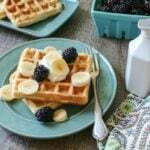 You can make them allergy friendly–dairy free, peanut free, corn free, even gluten free. They are completely customizable to your flavor preferences! 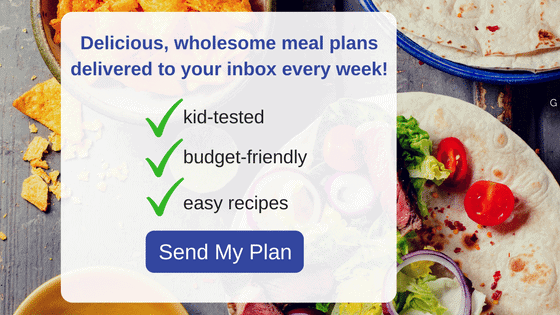 Seasonings–any combination you like! I personally opt for garlic powder, dried oregano, dried parsley, and onion powder. 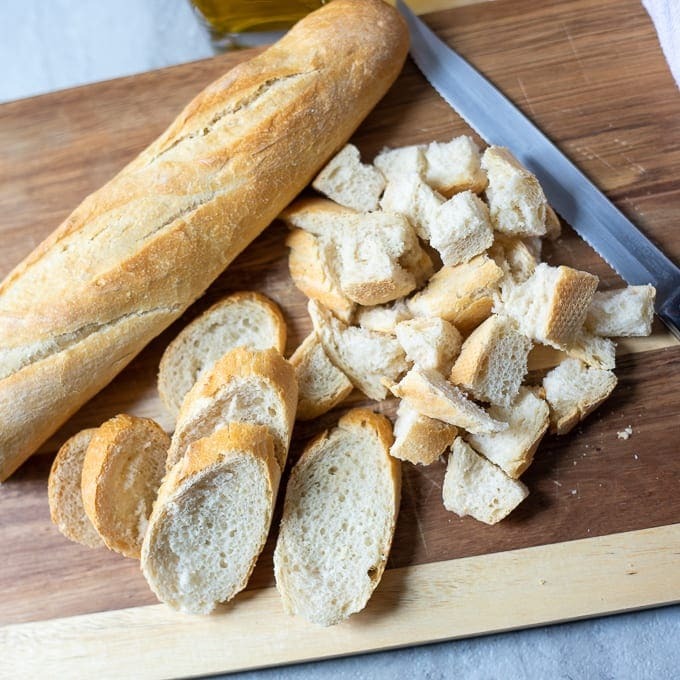 Cut up bread into 1/2 inch chunks–think bite size! Place diced bread onto a large rimmed baking sheet. Drizzle with olive oil and shake to coat bread. Add in seasonings and mix well to distribute seasoning evenly among bread cubes. Spread bread cubes out into even layer on baking sheet. Bake for 10 minutes, give the pan a shake. Bake for additional 5 minutes, or until croutons are browned. Once croutons have cooled completely, store in air tight container for up to 2 weeks. You can freeze croutons as well, but then I find they are best used for stuffing, not to top salads. 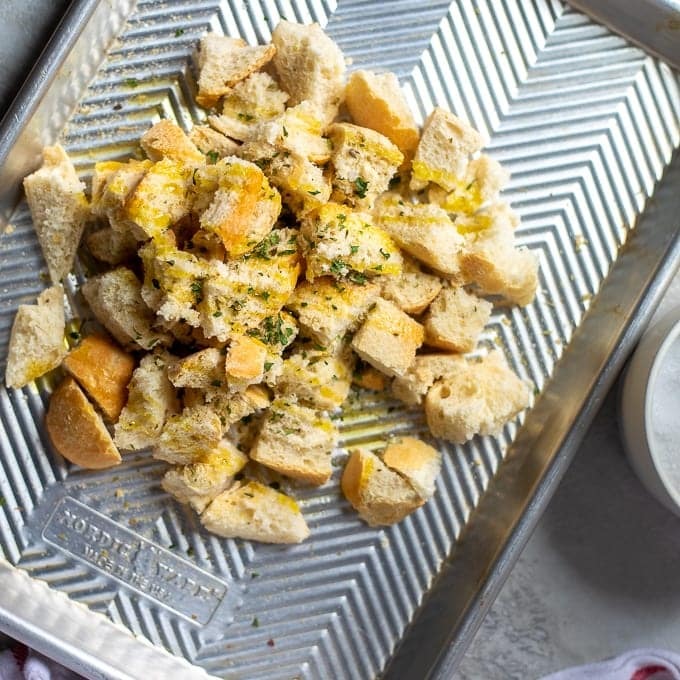 You can use any bread you like to make croutons, but my personal favorite is Italian Bread or French Bread. The mild flavor of these varieties really lets the flavor added to the croutons come through. For whole wheat croutons, use my whole wheat bread recipe. For uniform croutons, feel free to cut off crusts–I never do, but some people prefer the look of croutons without the crusts. 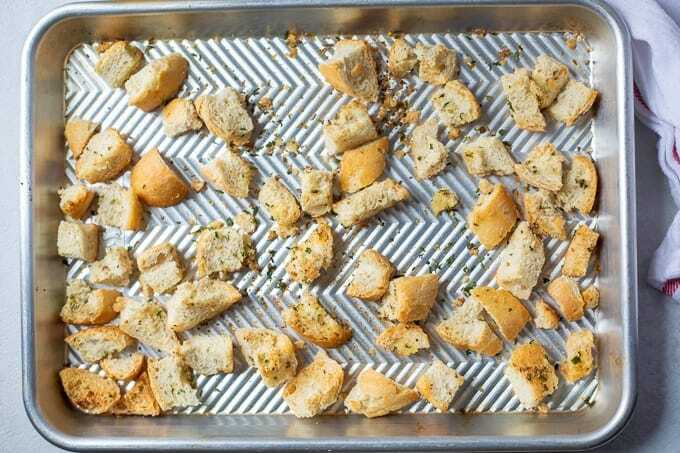 You can toss your bread cubes in a mixing bowl with the oil and spices, but I like to just do it all on the baking sheet–less dishes!! If you would like Cheesy Croutons, add 1/4 cup grated Parmesan cheese to the seasoning blend before tossing the bread with the seasonings. Cut up bread into 1/2 inch chunks. Drizzle with olive oil and shake to coat bread. Add in seasonings and mix well to distribute seasoning evenly among bread cubes. Spread bread cubes out into even layer on baking sheet. Bake for 10 minutes, give the pan a shake. Bake for additional 5 minutes, or until croutons are browned. Use immediately, or once croutons have cooled completely, store in air tight container for up to 2 weeks. You can use any bread you like to make croutons, but my personal favorite is Italian Bread or French Bread. We eat a lot of salads and making our own will be awesome. Thank you for sharing. I love how simple making homemade croutons is! This was a great way to do it, will be saving this recipe for sure!